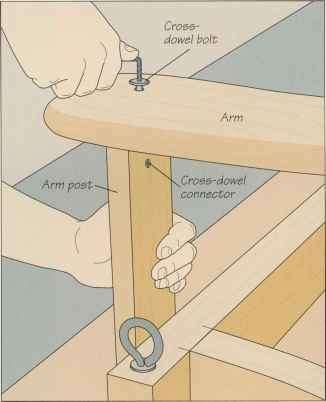 You need to rout a groove in the upper back rail to hold the back slats. Fit a Vz-inch three-wing slotting cutter in a router, then mount the tool in a table. Mark the points on the face of the stock where the cut should start and end. Also mark the points on the fence where the bit starts and stops cutting. Adjust the height to center the groove in the edge of the rail. Turn on the router and pivot the rail into the cutter, aligning the front cutting line on the workpiece with the bit cutting mark on the fence farthest from you (above). 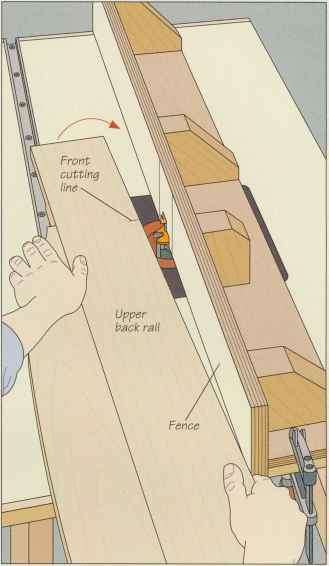 Push the rail along the fence until the back cutting line aligns with the bit cutting mark closest to you, then pivot the trailing edge of the workpiece away from the cutter, steadying the board against the table and fence by hooking your left hand around the front edge of the table. Use a chisel to square the ends of the groove, if necessary.